Online applications are invited from the eligible candidates willing to appear for Typewriting and Shorthand examinations scheduled in the month of January/February, 2019. The Principals of Typewriting and Shorthand Institutes, which are recognised by the Department of Technical Education, Andhra Pradesh, are alone eligible to sponsor the candidates for the Typewriting and Shorthand Examinations schedule to be held during January/February, 2019.The applications of Typewriting Examinations sent by the Principals of unrecognised Typewriting Institutions, will be rejected without any intimation and the examination fee paid by them will be forfeited.Private candidates appearing for Typewriting & Shorthand Examinations are informed to go through the instructions given below carefully before filing the applications. (a) Typewriting Lower and Higher Grade Examinations both in English and Telugu will be conducted in 4 batches. (b) Typewriting Junior Grade in English Examinations will be conducted in only one batch, where the exams are scheduled for only one day i.e. along with the First batch of Higher Grade Examination and in two batches i.e., (I and II Batches) at the examination centres where exams are scheduled for two days i.e. along with First batch & Third batch of Higher Grade Examinations. (c) Typewriting Urdu, both Lower and Higher Grade, Examinations will be conducted in one batch each, at Govt.Polytechnic, Vijayawada only, in view of very less number of candidates appearing for these examinations. (d) Typewriting Hindi both Lower and Higher Grade Examinations will be conducted in one batch each in view of very less number of candidates appearing for these examinations. (e) Totally blind candidates are also permitted for Typewriting Examinations. Separate Typewriting Question Paper in BRAILLE LANGUAGE will be given. (f) The candidates must apply through a recognized Typewriting Institutions in Andhra Pradesh in case of first appearance for any of the examinations (any language or any grade). Subsequently one can appear privately by enclosing a copy of his previous Hall Ticket and requisite qualifications along with downloaded online application. 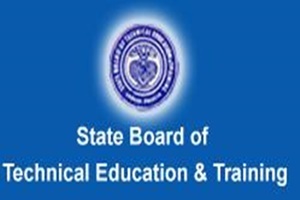 Candidates can appear for shorthand examinations directly and submit their downloaded applications along with requisite documents to State Board of Technical Education and Training, Andhra Pradesh Govt. Employees appearing for the examination shall seek permission from their employer for appearing the examination. Instructions mentioned in the notification should be strictly adhered to. (g) Typewriting Examinations will be conducted during the first week/second week of February, 2019 tentatively. (h) Online application will be commenced tentatively during the last week of November, 2018 and will be placed in the SBTET website. 1 Typewriting English Junior A pass in VII Class examination/VIII Bonafide Certificate with the date of birth. 2 Typewriting English/Telugu/Hindi/Urdu Lower An appearance of SSC Examination or equivalent. Candidates should enclose attested Xerox copy of hall ticket if marks statement is not yet issued. Where the marks statements are issued, an attested Xerox copy of marks statement should invariably be enclosed to the application. 3 Typewriting English/Telugu/Hindi/Urdu Higher A pass in Lower Grade examination of the subject and language along with a pass in SSC or equivalent examination or Intermediate or equivalent from any recognized Board as per G.O. Rt No. 194, Higher Education (TE-II) Dept. date: 17-03-2005. Candidates qualified in Lower exam., of Maharastra Govt. will not be admitted except those who qualify as per G.O. Ms. No. 921, G.A. (Ser. B) Dept. dt. : 19- 06-62. 1 Shorthand English/Telugu/Urdu Lower A pass in SSC or Equivalent Exam. 2 Shorthand English Intermediate A pass in Shorthand Lower Grade Examination or any Graduation from the recognised University. How Can I apply for typing exam. How to apply for January /February 2019 lower test.